Have you seen the new commercials for Quilted Northern’s Designed to Be Forgotten campaign? It’s absolutely brilliant. Not to mention hilarious. From Sir Froggy and Daddy Gator to Little Miss Puffytail and poor Great Grandfather Thaddeus, they all have one purpose: To decorate the bathroom. They hold the toilet paper, add a quirky design element to the walls, and everyday they see things that can not be unseen. They all share a common bond they wish they didn’t. So this got me thinking about the objects in our bathrooms. Meet Travis the Two-Legged Turtle. He looks happy right? He’s smiling from ear to, er, eye to eye. (Turtles have no outer ear.) He has a gorgeous shell that looks like a well crafted mosaic. But Travis has been given a tough lot in life. First of all, he has two legs. Only two? Why? No one knows. Not even Travis. So, he’s been nicknamed Travis the Two-Legged Turtle. And there he sits. In the bathroom. Seeing things that no reptile should have to. Other turtles can retract their heads when faced with a dangerous or disturbing situation. But not Travis. Nope. He can’t move. 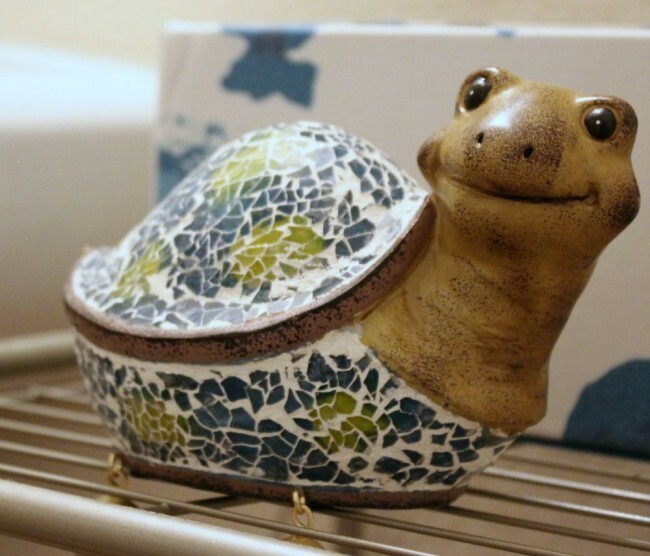 He’s ceramic. Other turtles can close their eyes. But not Travis. Nope. Again, he’s ceramic. What does he think about his current living situation? Let’s hear it from Travis himself. “There I was, sitting on a shelf in the store with elephants, a peacock, a rhino with no body and other random objects. We were a community of misfits all waiting for a home. Some days I longed for a home more than others. That day finally came. This blonde lady and her three children picked me up off the shelf, examined me for a minute, looking slightly confused when they only saw my two legs, but had pity on me and took me home. The car ride was exciting. I kept thinking of being placed by a man-made backyard pond or on a patch of green grass where butterflies would land. A place I could see the sunset and sunrise. Or even in the living room where I could watch documentaries on nature and travel. But no. She put me in the bathroom. 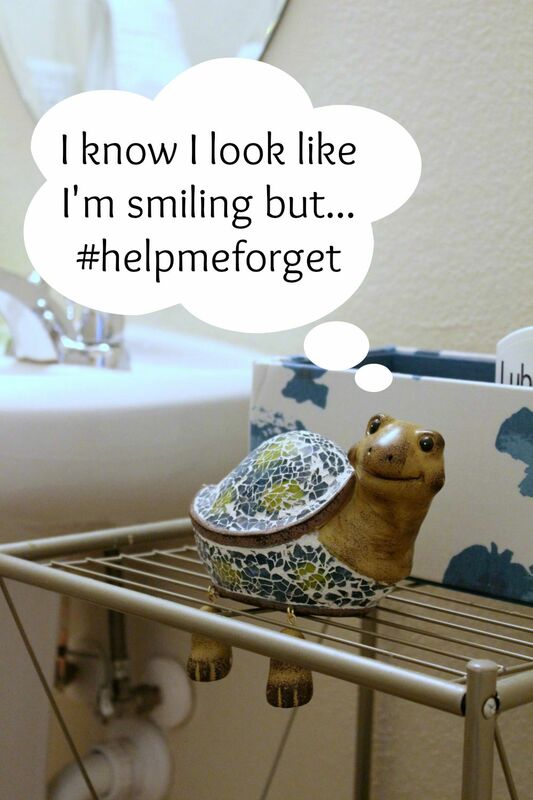 Worst of all, she put me where I face this large white ceramic looking thing where things happen that no self-loving turtle would ever discuss with anyone. Ever. 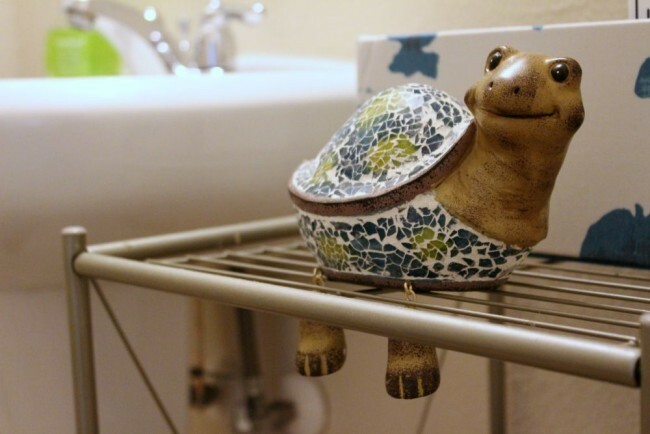 It’s easy to forget your bathroom experience when you use Quilted Northern, but not when you’re Travis the Two-Legged Turtle. Travis would like me to tell you that he’s working on getting a petition together to be removed from his current location. Good luck Travis. To see the series of Quilted Northern Videos featuring other items that can never forget, go here. Here’s one video featuring my favorite – Sir Froggy.